Subject: Implementation of Government decision on the recommendations of the Committee Secretaries Committee- 2012 on the issues related to Defence Service Personnel and Ex-Servicemen- Improvement in Casualty Pensionary Awards for pre- 2006 Armed Forces Officers and JCO/ ORs and equivalents. Reference:	This Office Circular No. 503 dated 17.01.2013. Kindly refer to Table No. 1 appended in this office circular cited under reference. Your attention is invited wherein to various nomenclature columns (Column 6, 8, 11, 13, 17,19) the 2nd Life awards of SFP and 2nd Life awards of LFP have been shown. However, in the case of Commissioned Officers it should be Dependent Pension (Special) and Dependent Pension (Liberalised). In order to facilitate the PDAs for smooth revision and implementation, the same has been rectified and an amended Table No. 1(Revised) is enclosed for necessary revision/ action. It is also mentioned that the rates of Dependent Pension (Liberalised) in case both parents are alive are @ of 75% of LFP. This has been left out inadvertently which has now been reproduced in the revised table. 2. 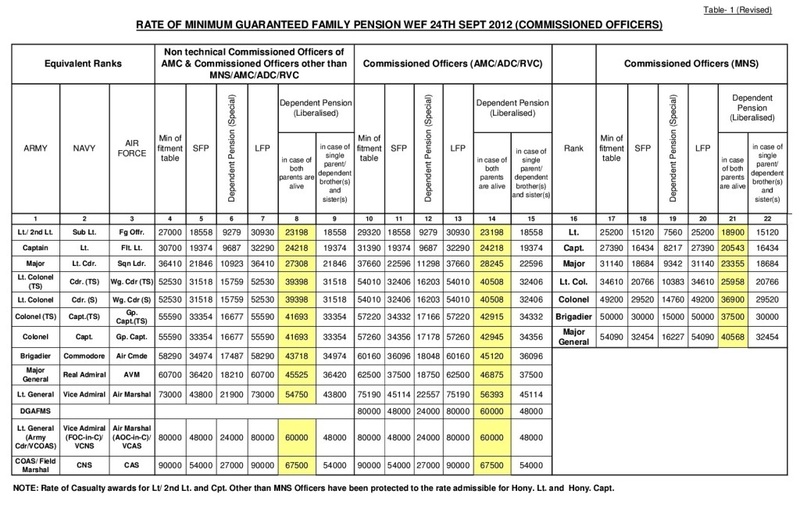 All Pension Disbursing Authorities are authorized to revise/ update the family pension in respect of Commissioned Officers equivalent as per tables attached to this circular, if the same is beneficial. Table No. 1 appended in Circular No. 503 is replaced by Table No. 1(Revised) annexed with this circular. 3. All other terms and conditions for revision of family pension in respect of pre-2006 Armed Forces family pensioners drawing pension under casualty pensionary awards shall remain unchanged. Dated: - 19th February 2013. 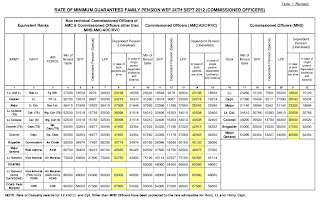 Central Government Employee News and Tools: One Rank One Pension Order: Revised Table 1 - Improvement in Casualty Pensionary Awards for pre- 2006 Armed Forces Officers and JCO/ ORs and equivalents.